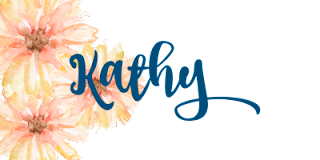 #stampinup #faithfulinkspirations I'm having so much fun with the "Country Home" stamp set--even thought need to color the images! IKR?! For today's card, I broke out my Watercolor Pencils and Aqua Painter and went to town. I'm so pleased with hos this card turned out! I stamped the pitcher and the floral arrangement in Memento Tuxedo Ink onto Shimmery White Card Stock. I colored the pitcher with the Early Espresso Watercolor Pencil and then spread the color with the Aqua Painter. I used the Early Espresso Pencil again to color the seed pods. I also used Old Olive, Pumpkin Pie, and Daffodil Delight Pencils on the other floral images and used the Aqua Painter to spread the colors. Guess how I did the cotton! I just used the Aqua Painter and grabbed some of the Tuxedo Ink from the image! I cut the image out with one of the Layering Ovals Framelits. Next, I stamped a sentiment from the same stamp set in Memento Tuxedo Black Ink onto Shimmery White Card Stock. After it was dry (I used my heat tool), I punched it out with the Everyday Label Punch. Next, I adhered it to an Early Espresso Card Stock Oval that I cut with one of the Stitched Shapes Framelits. I embossed a 3-3/4" by 5" piece of Pool Party Card Stock with the Tin Roof Embossing Folder and adhered it to a 3-7/8" by 5-1/8" Early Espresso Card Stock mat. I wrapped a length of Crumb Cake Classic Weave Ribbon around before adhering this to a Crumb Cake Card Stock card base. 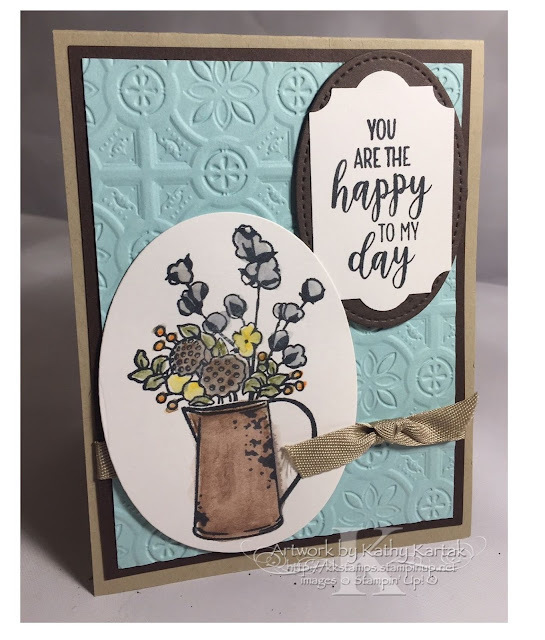 I used Stampin' Dimensionals to adhere both the pitcher oval and sentiment oval to the card. Such a pretty still life, don't you think? Come on back tomorrow for another "Country Home" card!